Montreal, QC – November 12, 2015 – Formula DRIFT Canada has announced its 2016 season schedule. Sliding into its third year of competition, Formula DRIFT Canada is expanding its professional drifting series to a total of five rounds. 2016 will represent many firsts that will continue to grow drifting in Canada and will once again raise the bar to new heights. The Formula DRIFT Pro Championship will be heading to Montreal in 2016. This marks the first time in history that an Formula DRIFT Pro Championship round will be held outside of the United States. “With the continued success of our international presence, we look forward to growing the sport domestically and internationally this upcoming season,” said Jim Liaw, president and co-founder of Formula DRIFT. Formula DRIFT Canada will also be bringing professional drifting back to Ontario for the first time in 5 years. Sunset Speedway located in Barrie, just 45 minutes north of Toronto, will be the home for Formula DRIFT Canada in the coming years. “Sunset Speedway is excited to be the only racetrack to have an official Formula DRIFT Canada round in Ontario. We are looking forward to hosting thousands of passionate fans when professional drifting returns to Ontario.” says Mark Dilley, owner of Sunset Speedway. 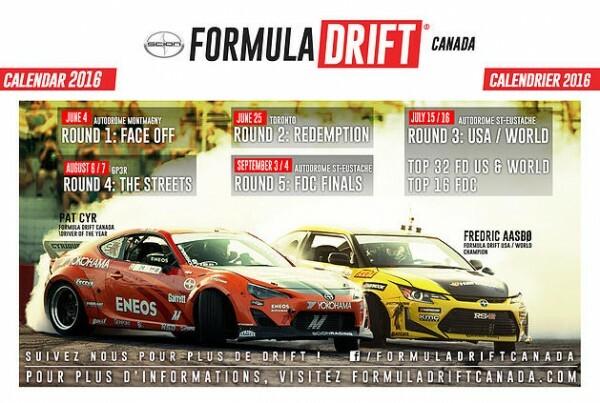 The Formula DRIFT Canada championship series will also be returning to Autodrome Montmagny (Quebec), Autodrome St-Eustache (Montreal) and GP3R (Trois-Rivières). Launched in 2014, Formula DRIFT Canada is a professional drifting series sanctioned by Formula DRIFT. Its organization is made up of a team of experienced members from the motorized sport and drifting worlds: Alan Labrosse, president, Ben Woo, vice­-president of sales and partnerships and David De Somma, director of events. In 2016, the series will hold five championship races: June 4 at Autodrome Montmagny, June 25/26 at Sunset Speedway, July 15/16 at Autodrome St-Eustache, August 6/7 at the Grand Prix Trois­-Rivières and September 4/5 at Autodrome St-Eustache. For more information, visit: www.formulad.ca. In its 13th season, Formula DRIFT is recognized as the leading international drifting championship. Established on the streets of Japan, drifting has evolved into a worldwide competitive sport that challenges each driver’s driving ability and vehicle control. Formula DRIFT provides a forum for professional drifters to compete nationwide for the coveted Formula DRIFT Championship crown. As the first official series in North America, Formula DRIFT has taken competitive motorsports to the extreme, attracting fans and car enthusiasts from all walks of life and establishes itself as the world­wide leader for the sport. For a competition schedule and ticket information, visit: www.formuladrift.com.